Today, piracy is an illegal business that has a significant negative impact on fashion brands and unfortunately it has become one of the world’s fastest growing enterprises. Technology grants businesses numerous ways of communication channels to facilitate the interaction between their target consumer and them. Nevertheless, technology has also helped the counterfeiting business develop at a rapid speed. E-commerce means business, especially in the fashion world, but what should companies do when it has become too easy for counterfeiting products to reach the consumer? Fashion brands have begun to fight back in the same way the movie and the music industries have: with lawsuits and campaigns. Louis Vuitton, Christian Louboutin, Coach, and Chanel have reported thousands of arrests of fake merchandise shipments and the ownership of domain names that were used for trafficking. Most domain names used for piracy have the same domain name as the legitimate brand; this can confuse consumers or pursue them into buying a knockoff product that offers inexpensive manufacturing at low prices. Counterfeit consumers can be categorized into two groups: the deceived and the non-deceived.Non-deceived consumers are aware that they are buying fake products and also aware of the differences between the price-points of the real product and the fake. On the contrary, deceived consumers believe they are buying a real product and expect the brand’s promise, which can damage the brand’s reputation and decrease the number of loyal consumers the brand possesses. It is known that buying counterfeiting merchandise is as easy as buying coffee in New York or opening Safari on an iMac, which damages a brand’s reputation severely. What should a company do to recapture its good reputation? Just what Christian Louboutin, Louis Vuitton, and Coach have been doing, fight the counterfeit chain from the roots - from manufacturers, wholesalers, retail operators, website frauds, as well as flea market sellers. Despite the proliferation of piracy, brands have enjoyed few victories on fighting the spread of counterfeit items across the world. According to ABC news, last week the U.S. Customs and Border Protection confiscated 20,457 pairs of fake Christian Louboutin shoes at the Los Angeles/Long Beach seaport. 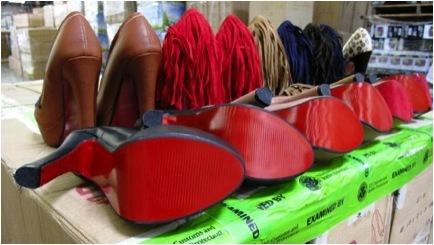 The knock-off red sole shoes were transported in five different shipments on large cargo boxes from China, while the original Christian Louboutin shoes are made in Italy. On a different case, Louis Vuitton Company sued Chinatown landlord for allowing the sale of counterfeit goods at seven Canal Street retail locations, concluding in the eviction of numerous tenants who sold fake Louis Vuitton handbags. A trademark and brand’s reputation is what differentiates a fashion company from the rest. We all know that Christian Louboutin’s trademark is the so famous “red sole” or that Louis Vuitton’s is known for its outstanding stitching and leatherwork. These two companies have implemented various marketing strategies to make their trademarks stand out from the competition to increase their profit and market share. Should they use their effective marketing techniques on anti-trafficking campaigns to capture delinquents as they use them to reach their target consumer? In May 2009, Coach Inc. launched a litigation campaign against counterfeit products called “Operation Turnlock” to eradicate counterfeit practices on their products, and it is until now that the dispute has paid back. “Operation Turnlock” and the ownership of domain names by Coach ##Inc. have benefited the company’s shares. Last Thursday, Coach Inc. closed at $57.19 and the stock has also risen 14% in the past three months. Furthermore, Coach Inc.reported that rising overseas revenue has helped lift its profit for the third quarter by 3%. A tight outcome considering the situation our economy is in regarding fashion brands. China is the number-one country in counterfeit merchandise production; U.S. Customs and Border Protection have been confining shipments coming from Asia for years now. Counterfeit businesses are constantly changing their schemes in an effort to pass inspection. It is a cat-and-mouse game between the fashion industry and delinquents. Trafficking affects corporate profits on billions of dollars in losses and jobs on the line. With this said, should consumers also feel responsible and act against the enrichment of Asian illegal business and the negative impact that these illicit activities are causing in our economy? Business is a two-way transaction, if consumers stop buying, the business will stop functioning which will help balance the unstable economy that fashion companies in Europe and U.S. are facing today.